The critters sense that the weather outside will be—already is—frightful. I almost need traffic signals and turn lanes in my yard and driveway where the squirrels are frantically harvesting nuts from the walnut trees. Canadian geese have noisily moved in mass overhead traveling south. I’ve not had feedback from the deer, but they must have felt the hosta in my xeriscape was especially tasty as they have, again, totally decimated all of them as they prepare for winter snow cover. You see, we live in the country and our road ditch is steep, difficult to weed whip and impossible to mow. We created an attractive xeriscape using mulch to cover grass and weeds and rock to stop an area of erosion, then added a few perennials for interest. Maintenance has been minimal. This spring we plan to xeriscape a smaller area on the other side of the lane. An article in a recent Master Gardener’s newsletter sparked my interest in perennial ornamental grasses. Linn County Master Gardener, Becki Lynch says ornamental grasses have few enemies. Deer, rabbits, squirrels, even insects seem to not be interested in them. Becki describes the grasses as “beautiful, regal, feather topped, silver sheened, golden stemmed, ten feet tall, back-lit by the sun and swaying in gentle breezes.” After established, ornamental grasses are drought resistant. You can fertilize them—or not. They do like mulch. And, ornamental grasses come in a multitude of heights, shapes and textures. Ornamental grasses sound like a plan to me. What do you think? Oh, when, oh when will seed catalogs start to arrive? Even if we can’t work outside in Iowa’s winters, we can still enjoy gardening by listening to someone from the Master Gardener’s Speaker’s Bureau. A colorful and educational presentation on any number of gardening topics is available for your group or organization. Contact the Linn County Extension Office at 319-377-9839 for a brochure reflecting the range of speakers’ experience. As much as I enjoy viewing the red, orange and yellow landscapes of an Iowa autumn, there are fall colors that I enjoy even more. Turtlehead and Japanese anemone are autumn perennials that are pretty in pink. 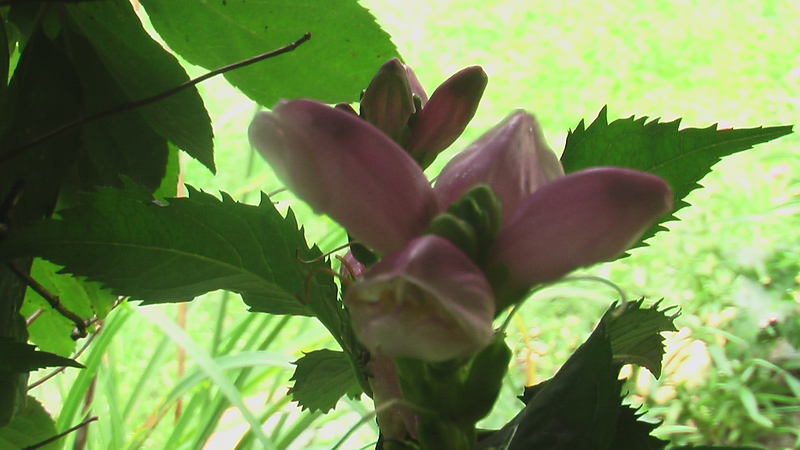 Turtlehead, also known as chelone, is a North American wildflower that grows in moist shade gardens. They bloom in late summer, but mine is still blooming, now, in October. 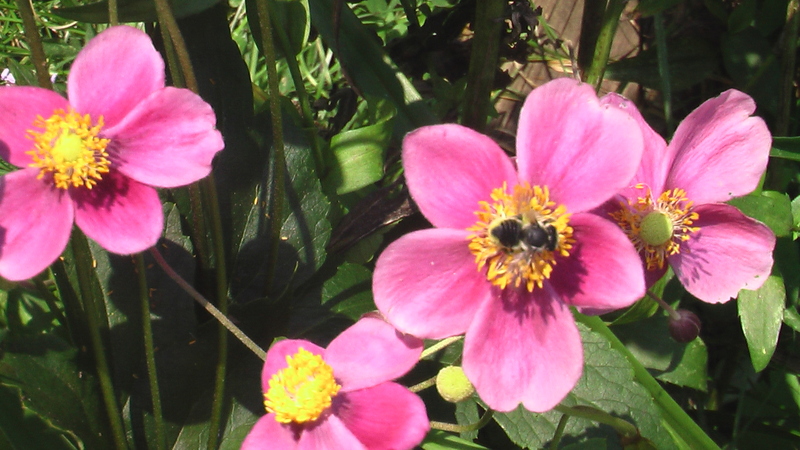 Japanese anemone also comes in other shades, such as white, but my favorite is the fall-blooming pink variety. 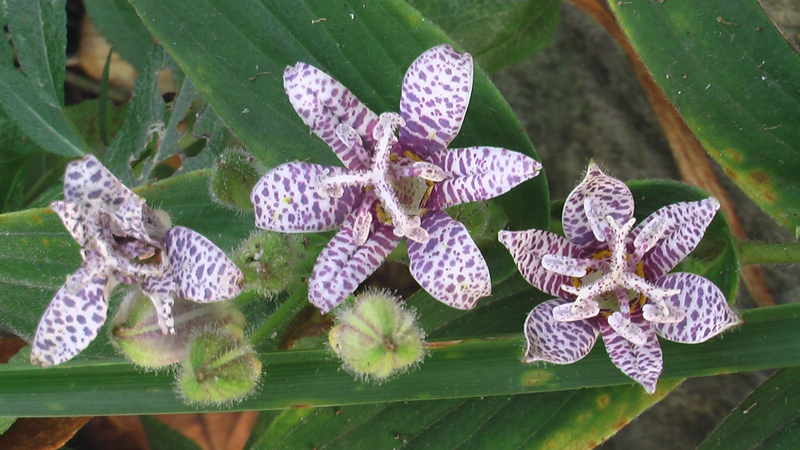 Toad lily, a plant with both an awesome name and flowers, is in the orchid/purple color scheme. Also known as tricyrtis, toad lily also grows in moist shade gardens. I’m seeing more varieties offered in garden catalogs. Mine came from the Linn County master gardeners sale a few years ago and is always fun to see blooming when most other perennials have finished for the season. My granddaughter was reading to me the other day and asked me to define “etc.” and eucalyptus”. That got me to thinking that there have been several occasions where I’ve been a bit embarrassed because I didn’t know the definitions of some gardening words. Following are a very few of the multitudes of terms. Acid Soil: soil with a pH less than 7.0. Acid soil is sometimes called “sour soil” by gardeners. Most plants refer a slightly acid soil between 6-7 where most essential nutrients are available. Alkaline Soil: soil with a pH greater than 7.0, usually formed from limestone bedrock. Akaline soil is often referred to as “sweet soil”. Berm: a low, artificial hill created in a landscape to elevate a portion of the landscape for functional and aesthetic reasons such as to add interest, screen areas, or improve drainage. Canopy: the total overhead area of a tree including the branches and leaves. Cold Hardiness: the ability of a perennial plant (including trees, shrubs and vines) to survive the minimum winter temperature in a particular area. Complete fertilizer: powdered, liquid or granular fertilizer with a balanced proportion of the three key nutrients-nitrogen (N), phosphorus (P), and Potassium (K). Compost: decomposed organic matter added to the soil to improve its drainage and ability to retain moisture. Corm: a modified bulb-like stem. It is swollen, short, solid and located underground. Crocus and glads are two plants that grow from corms. Cultivar: a CULTIvated VARiety. A unique form of a plant that has been identified as special or superior and has been selected for propagation and sale. Deadhead: to remove faded flowers from plants to improve their appearance, prevent seed production, and stimulate further flowering. Deciduous Plants: trees and shrubs that lose their leaves in the fall. pH: a measurement of the relative acidity (low pH) or alkalinity (high pH) of soil or water based on a scale of 1 to 14, with 7 being neutral. Individual plants require soil to be within a certain range so that nutrients can dissolve in moisture and be available to them. Rootbound (or potbound): the condition of a plant that has been confined in a container too long. Its roots are forced to wrap around themselves and even swell out of the container. Successful transplanting or repotting required untangling and trimming away some of the matted roots. Self-seeding: the tendency of some plants to sow their seeds freely around the yard. It creates many seedlings the following season that may or may not be welcome. Slow-acting (slow release) fertilizer: fertilizer that is water soluble and releases its nutrients when acted on by soil temperature, moisture and/or related microbial activity. Typically granular, it may be organic or synthetic. Variegated: having various colors or color patterns. The term usually refers to plant foliage that is streaked, edged, blotched, or mottled with a contrasting color, often green with yellow, cream or white.